There is another supposedly unreleased Arpanet track floating about cyberspace at the moment. This time it is an original called 'Quantum Computing'. Gravitational Lense(Chwolson Xallarap remix) is the other one. Not sure if this stuff is meant to be leaking out or not and so far there is no word on a new Arpanet album, remix or otherwise. (new text)As of 26th Feb it was brought to my attention that 'Quantum Computing' is more than likely the work of someone else. I just call them like I see 'em but will leave the post as it was from this point on and let you decide for yourselves what you think. I must say that both tracks, I would also be suspicious about the remix now, are very good and if the person(s) responsible doesn't have a record deal they should. Whoever titled the remix really knows their stuff as if it is a fake it certainly fooled me. I think it's acceptable that I'll be wrong from time to time when I'm working so much in the dark, I'll always remember how hard it was for me to decide if Black Replica was a hoax or not. If you have the time and want to go deeper you can read all about the first and only commercially available quantum computer, just launched by D Wave Systems at a link below. A more objective view of this new, possibly quantum computer, can be read at Wikipedia. If you were wondering what Chwolson Xallarap is then wonder no more! Well first off a gravitational lense is formed when the light from a very distant, bright source (such as a quasar) is "bent" around a massive object (such as a cluster of galaxies) between the source object and the observer. Orest Danilovich Chwolson (1852-1934) was a Russian physicist who is most noted for being one of the first people to study the gravitational lens effect. Lastly the Xallarap effect (an analogy of parallax) is a variation in a gravitational lensing observation caused by the orbital motion of the source. But it is just as equally about the music as concept and in this case I can report the music is great, see what you think. These 'send space' links usually have a time limit on them I think so best to act quick. 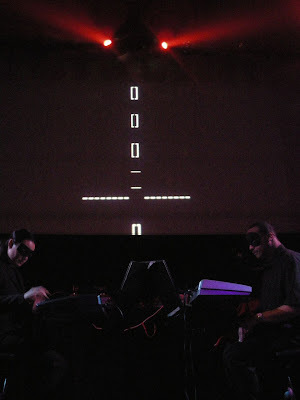 Live footage of Dopplereffekt in Amsterdam on 23rd Feb 2008 as a duo below. Another new Heinrich Mueller involved MySpace project has come to light. Zerkalo is a project said to be co-produced by Victoria Lukas and Heinrich Mueller. They list their location as being Germany/USA and France. According to their site they have been lurking here since November 2006, although the video they have up right now on YouTube for 'Warning You' was only uploaded in the last few days. They might have had one up before this however but it's not viewable now, but am not sure on this. I think that Victoria Lukas is a member of a group called Weltgeist as well but uses a different name for it, they have a MySpace page, of course, link below. 'Warning You' is an instrumental track which is pretty Muellerish I guess, minimal, atmospheric, dark, but more old school Mueller than new if you know what I mean. This track is also on their audio player plus one more, 'Watch It Burning Again'. This one has a female voiced lyric and is pretty short but very sweet. It's done very much in the vein of Zwischenwelt/Black Replica. They are also actively touring, check the dates on their site for yourselves. I found a link to footage of one of their previous gigs and not surprisingly it appeared to feature only Victoria Lukas. On their site and even in the video which is made up of scenes of Andrei Tarkovsky films they make it clear that they are influenced by this director and the type of images he made his own with his trademark long and lingering shots. They have two pretty desolate looking photos on their site as well, see one below. I'm just wondering, as you probably are, how many more of these collaborative projects are out there because when I do get up to date with the Heinrich Mueller releases I am planning to go into detail concerning all of his side projects, have to keep myself busy somehow. But in this case I might have an advantage in that I happen to be a bit of a Tarkovsky fan ever since a reviewer in The Wire said of a band I was in at the time called Memory Cells (almost 10 years ago now) that it reminded him of the work of just that director. After that I decided I should probably make it my business to see some of his work. I know that one of the films they used footage from for the video is 'Mirror'(1975), which is said to be one of his more autobiographical works. Also their name, Zerkalo, is the Russian for Mirror and is an alternate title. Not that this is hard to work out in the age of the internet! I guess we should keep an eye on this project as well then. Also a remixed version of the Arpanet album 'Inertial Frame' might be in the offing soon. I was sent a link to a remix from it but I couldn't find any reference to it on web or even on the Record Makers site, so give it a listen as well while you wait. No sign of the Der Zkylus 12” being released either, should be anyday. I have lots of mostly Heinrich Mueller related news I've been storing up for you. First off there appears to be another MySpace collaboration in progress called Daughter Produkt. While there is yet to be any music or videos added to the site it does list the other members as being Moreno Paradox, Douglas McCarthy and Heinrich Mueller. It's been up since October 2007 and their location is given as Germany. The only member I found a possible identity for was the Douglas McCarthy of Nitzer Ebb and while he does have a history of collaboration the main Nitzer Ebb website has yet to list this project as one of his. While I hate to be negative I must say that whoever they are, they have managed to saddle themselves with quite possibly one of the worst sounding names for a group ever, in my opinion. It does however contain the same amount of syllables as Dopplereffekt and ends with the same German spelling. If it’s for real I look forward to it but it could so easily be a hoax as well. Their photo makes me think it is legit though. I guess we’ll just have to wait for some music to arrive there. Dopplereffekt played last weekend in Barcelona, Spain at Nitsa on 9th Feb. I just found out about it myself. A fairly poor video of it is up at YouTube. They seem to be dong a hit and run tour all over Europe right now since 2nd Feb in Sweden. The next show that I know of is on next weekend in Amsterdam, Holland at the Sugar Factory on 23rd Feb. I wonder if they have anything lined up for this weekend and what else is planned? There’s been an intriguing Der Zyklus live video up for some time on You Tube but check out the primitive rendering of the Black Replica symbol which flashes up on the screen at the 5 min 10 sec mark. The girl by the way looks like To Nhan Le Thi and is using the same Korg keyboard which she used when appearing as Dopplereffekt in 2007. Nice video here of Dopplereffekt as a duo at Basel, Switzerland in 2007. While there are now tons of great music videos done by fans relating to Drexciya and Gerald Donald, one of my favourites is hard to find. I forget how its tagged but it’s a break-dancing video which uses the Dopplereffekt remix of Air’s ‘Le Soleil Est Pres De Moi’ from 2001. This is a real rarity anyway, it was only available on a free CD with some French music magazine I think. I’ve only heard it here myself. It’s also a great track, a personal favourite even. I might as well give you some more links while I‘m about this. As you might know, the official video for Arpanet ‘NTT DoCoMo’ is up on You Tube and has already had well over 10,000 views. You might think that this figure would have to be the highest for anything related to Drexciya/Gerald Donald there to date. That honour would have to go to the video for ‘Satellites’ by Dopplereffekt which is about to break the 17,000 barrier. The official video for ‘Scientist’ is of course up there too. The next two links are for two ‘so great they should be official’ videos for Arpanet, ‘No Boundry Condition’ and ‘Infinite Density’ from Inertial Frame. Finally, the best till last! Someone put up the Liz Copeland Detroit radio interview with James Stinson with some cool visuals on You Tube. This should give this important piece of the Drexciyan jigsaw some permanence and accessibility for all. 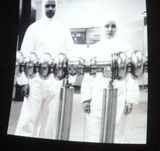 Dopplereffekt returned after a six year absence with their 'Linear Accelerator' album in 2003. Only released on Gigolo worldwide and with no Dataphysix US edition as previous or even vinyl counterpart to the CD, this was a new beginning for the way Gerald Donald conducts his business and as we will see, for how he approaches his music. I call him Gerald Donald because there is no personnel credits given on the album or 12". The only, quite graphic, evidence of membership is the picture of Donald and a female that looks very like To Nhan Le Thi, previously pictured on the 1999 'Gesamtkunswerk' album. This image does perfectly follow on from that album but is one of the only pieces of continuity from that period. By the way, the girl who appeared as Dopplereffekt during 2006 in Sweden and elsewhere appears to be this person. So I guess they are still together as a group in some sense. I say in some sense because there are no female vocals or any other contributions which you could pin directly on her, but that is not to say she wasn't equally at the controls. Of course, somehow we all take it for granted at this stage that Donald does the all the music by himself and this would be my feeling and maybe we're way off by thinking that but somehow I doubt it. As we can see from this album and as mentioned, just last year, she certainly still has her place in the promotional and visual side of Dopplereffekt and as discussed in an earlier article, remains crucial in presenting the gender balanced aspect of the group . I also found another picture of them together somewhere or other in the web that looks like it came from the same session. Ok, that's the personnel out of the way, now it gets harder! Basically, to anyone that expected Dopplereffekt to sound like they did before, this album would come as something of a shock. In fact, if they had wanted to cash in, returning with a bunch of stark but catchy soundalikes from their 94 - 97 heyday, there was no better time than now for them to have done so. It all could have been spun so perfectly as well, the masters return, but as we have seen Donald appears to have run his course with this template, having arguably already pushed it as far as it could credibly go with the two Der Zyklus 12", an accessible debut as Arpanet, his work as Japanese Telecom, not to mention the many remixes, which may have been the real breadwinner for him outside of his many and multiple compilation appearances. I should probably state that I have no problem with an artist getting what they deserve and hope he made plenty of cash from a scene he did so much, perhaps unwittingly, to develop. 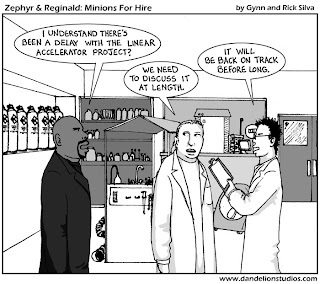 ‘Linear Accelerator’ is a long strange trip. Mind you, not so strange now, listening from this vantage point, but then yeah, for sure it was. 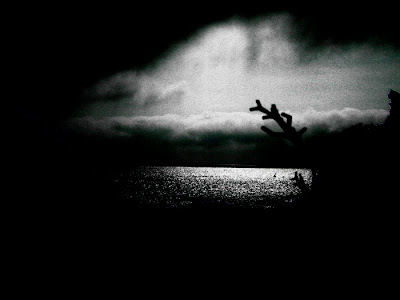 In some ways it's the musical equivalent of entering the computer generated image on the back cover of a black hole, you can't tell what will happen next, there is an unpredictability to the album. In the ’Gesamtkunswerk’ article I pointed out that one very big clue where they might be going next was to be found on the final bonus track on the CD. I guessed that this was recorded in either 1998 or 1999 which if truly a conscious decision to showcase what was coming next was truly a remarkably decision to take as 4 or 5 years is a hell of a long time to effectively put a concept for a sound on hold. His concept appears to create a synergy between the music and the subject, in this case, high-energy physics. In the process throwing out the rulebook and concentrating on creating music that actually sounded like it was made by a physicist or sounding like what the title was or aspects of it. His imagination would still be important of course because this cannot be a literal sound-a-like because these things don’t really have a sound as such. And return to it he will, with real gusto, but it is this new synergy between music and concept that is the key change for him from this point on. He may also have taken stock of how influential his production work had become and decided to create a musical form which would attract few imitators in the future. By creating something so original he is safe-guarding his music from becoming dated and immune to fashion and popularity. Time will tell on this one but in this most retrospective of ages it is rare indeed to come across something contemporary and original at the same time, for this reason alone the album has validity. The first track is the longest at a whooping 21 minutes and 8 seconds. Then the album gradually gets more accessible, both time-wise and melody-wise. Which does make it appear that one rumour of the time was true. That Donald was unhappily contractually obliged for one more album for Gigolo and decided, after much stalling, to give them an unmarketable and equally un-sellable dirge to get out of it. I don’t believe this for an instant but it speaks volumes about what was going through people’s minds to explain this release. On this subject, if you watch DJ Hells and Miss Kittin’s commentary on the Gigolo movie 'Freak Show', they mutually call Gerald Donald a genius when one of the tracks from this album comes on and go on to say how his music always makes them re-evaluate their own work. Not to mention the album gets the no doubt coveted by some Gigolo 99 catalogue number. Now maybe this was a massive miscalculation on Donald’s part if we was trying to stick it to Hell but because he has continued in this vein up to today I think it proves the lie to that rumour. Mind you, he hasn't released anything on Gigolo since, what that means, if anything, is anyone's guess. Gigolo certainly made his name in Europe, although of course it was Rephlex that gave him, as Drexciya, his first European exposure. Labels like Clone and Record Makers etc can do just as good a job for him, maybe better if they can give his projects more attention, but there again, who can tell, he's still wave jumping anyway. As I detailed in the previous article for Arpanet’s ‘Wireless Internet’ album, Donald there, for the first time, took a company, NTT DoCoMo and devoted an album to exploring its products and services and in so doing questioned what this said about humanity. The music he choose to do this with was accessible electro/electronic music, call it what you will, music that we expected h im to do to some point. Looking back now a transformation process was begun here, about 2001, right about when he was himself emerging from his headspace for the, itself transforming, Storm Series. The process is seemingly completed here on ‘Linear Accelerator’ where he again takes a company, really an organisation, DESY, and throughout the album explores what it does. But as I said, the key and final transformational difference here is that the music has also taken a quantum leap and has fully synergiesed with this very specific subject matter. Now, it’s up to you if you want to take such a literal viewpoint as mine but the timing and message of the Storm Series is there to be considered. There is no doubt that a gradual change has taken place for Gerald Donald. A move to much more specific themes than before and into a completely unrecognisable musical form than previous has from this point taken place for him and after 5 years it shows no sign of abating, only evolving ever deeper as he enters what, again must feel like something of a black-hole for him also, as you can’t possibly know where this field of research is likely to ultimately lead you. The field in this case, as we shall soon investigate, is particle physics, the stuff of you and the universe. Maybe it's best this time to start with describing the music before tackling the meaning. As mentioned, ‘Photo Injector’ is the biggie. Not before or since has Gerald Donald done anything even approaching 21 minutes on a single track. Placing it at the start of the album has to be a statement in itself, of seriousness of intent or perhaps of defiance. The first minute is without recognisable melody, just a gradually looping constant, at the 2 minute mark another textural layer appears, by the 4 minute mark another joins it. Each one hard to describe and then hard to tell apart once there, becoming as one. By this stage you can discern a scraping circular rhythm, like a rotating satellite or come other clichéd image which some hack reviewer would usually trot out when dealing with lonesome sounding minimalist electronic music. It goes on in this fashion for a full 10 minutes until it evolves into a reverb drenched bass which is very much a different track, although you can hear the previous passage continue low in the mix, but this does disappear as it disappears. Around the 12 minute mark some tasteful but very subtle synth tones appear and stalk the barren sound territory. Around the 15 minute point some strange vibrating rolling sounds begin. These curious sounds gradually become the only ones as the rest is mixed out. It ends then rather oddly in this random rolling fashion. There is however a natural bouncing ball effect here, something which Autechre managed to capture so well on ‘Drane2’, the final track on their classic 1998 LP5 . Mind you, if your looking for influences or a 'who else does it sound like' answer then I wouldn’t like to use them as that example. I really don’t find the music here like anyone else I’m aware of, that isn’t to say that someone hasn’t been doing this kind of stuff for years. I guess the most obvious thing it sounds like is soundtrack music, the reviewers of the time mentioned the composer John Carpenter of Halloween fame. That might just be because it's kind of scary in places though. ‘Niobium Resonators’ sounds machine like, there is an engine or motor driving this thing along from the start in the deep, dense and static filled swath of sound which hits you continually throughout. The sound is clipped though, coming at you in stages before going back to the start. At a still substantial 14 minutes 25 seconds this track is much harder going for the listener than the opener. There really is no melody here present, just a collection of high pitched and continually changing noises laid on top of the already described dense bed of movement. ‘Graviton’ doesn’t begin very promisingly if your still looking for something more accessible but once you get past its opening 'beyond minimal' minute and a half there is a pleasant enough passage of blips and bleeps which are soon joined by long arcs of tone. After awhile these arcs are left behind and replaced by a distorted and somehow majestic, even triumphant sounding synth line, if that is what it is, it could be generated by anything really. Loads more weird and higher pitched sounds dot the remainder of the tune, because it does now possess one, in the same fashion as the previous tracks last section, to fade. ‘Myon-Neutrino’ is amazing, especially considering what has just gone before. It was this track that Hell and Miss Kittin were so floored by on their commentary on the Gigolo movie. The production is quite simple, nice melodic bass line, and ghostly melody line played at higher register. Really just two main elements here, classic, could have been done anytime in the history of electronic music and should sound just as fresh well into the future, well up there with his best work for me anyway, full of emotion. No surprise to find that at 5 minutes 14 seconds it’s also the shortest track on the album. It was no wonder that Gigolo picked this to be on the 12” to promote the album. There is a real melancholy here, I like to think it may be a requiem for a departed friend. The most prominent sound on ‘Z-Boson’ is very much like Mike Oldfield’s Tubular Bells which is ok I guess as it does soon fill up with a bass line and a few sparse touches that gives it its own thing. It doesn’t really develop within its 8 and a half minutes though and while it’s the second most accessible track on the album, also included on the 2 track 12”, it’s kind of disappointing, it just goes on too long stuck in its groove in my opinion. I used it in a DJ set I played at an art gallery once and should have mixed out of it earlier than I did for this reason. By the way the 12” sampler which contained the last two tracks has another nice picture of Donald and To Nhan Le Thi in the same laboratory and the demarcations given to each side of the vinyl is e+ and e- which are the standard symbols for positron / electron. Drexciya of course have a track, 'Positron Island', so this does have some added significance here. I'm guessing that the artwork of formulas printed on the CD are all to do with the same subject as the album, not my field, but they look cool. Another beauty comes to end and redeem the album in the shape of ‘Higgs-Mechanism’. Long textured keyboard lines stretch out across its length joined by fiddly melodic computer patterns. It’s another weird one in many ways, sounding a bit incomplete but that kind of gives it a charm and identity of its own. It ebbs and flows just about comfortably over its almost 8 minute length and doesn’t seem to run over long within its limited variation. So what to make of that? Did I like it, I remember being more intrigued than disappointed when I first heard it but I suppose I like most people expected something similar, just a little updated than before. Now it's an album I genuinely like but can see of course how it’s really one for the fans. This is music which you have to go to, you have to make an effort with it, but it is not impossible to like it, find ways for it to enter your life. I for example am listening to it again, for the second time today just for pleasure, as I rewrite these paragraphs. The time is 7.20pm, a cat is asleep on a chair, I'm at my kitchen table with my laptop underneath a fluorescent tube. The music is certainly not blending in as background and is keeping my attention (track 2 on now which is not my favourite) but my point is that right now the music is a part of my environment and like anything else in this room right now it is filling my consciousness. Would anything about me change if I changed the music or switched it off altogether? Perhaps, but only my environment would have changed. I have actually heard this album played publicly, at what turned out to be the final live appearance by Coil in Dublin, during it’s DEAF festival in 2004. This was a fantastically unusual event itself, held in the grand entrance to Dublin’s City Hall, the only time a gig has ever held there. It was actually a friend of mine, Paul, a physicist, I kid you not, who brought it along to provide something to play as the doors opened. Paul also provided me with some of the technical information for the track titles I’ve used for this article. A circle closes! But I’m basically just asking, how weird is this, not very, we are so adaptable as human beings that with only a little effort we can accommodate anything new. Maybe that is something which Donald had to consider himself when he realised how his music was developing, would there even be a market for this stuff? It’s still not a record you should ever play at a house party or with your girlfriend/boyfriend but it’s also not for nerds only, it does exist somewhere between but as I said, you need to come to it, it’s for anyone who is willing to do that. But it will be a solitary listen nonetheless which I'm sure mirrors how it was made. There is a palpable feeling of sadness, a certain desolateness at the core of this experience. There might also be a consensus amongst people who stopped buying his stuff after this that all of his music since sounds the same but that would be way off the mark and I am keen to get to those albums soon for that very reason because on the surface yes they do appear to continue with similar subject matter and the music does has the same synergy with the theme but they are full of much shorter and accessible tracks. Some of course, like the last Arpanet album, 'Inertial Frame', even show signs of a return of a sense of humour and his next port of call after this very album would not even mention physics, particle or otherwise. Not to mention the variety of the work he is involved with as Black Replica and Zwischenwelt. Basically I think Donald has perfected this synergy since this album, but you know, I'm sure he wouldn't see it that way, these tracks are probably exactly as he wanted them, whether people like me find them accessible or not is probably not a concern of his. So what does it all mean. Well, I can tell you what it’s about anyway for a start. It is about high-energy physics, the area of physics dealing with subatomic particles moving at velocities close to the speed of light. The subject of the album is DESY (Deutsches Elektronen-Synchrotron) in Hamburg, Germany, where this examination of the stuff of matter goes on. It was established in 1959 and is one of the leading particle accelerator centres in the world. DESY is a national research centre supported by public funds and has locations in Hamburg and Zeuthen (Brandenburg). The album linear notes give both DESY location websites, one of which, at Zeuthen, does indeed have a ‘Photo Injector’ test facility which produced it‘s first photoelectrons in 2002 which might have been cause for Gerald Donald to celebrate and include a reference to it here. I'll get to it in more detail later but it's worth keeping in mind while taking in the following track title breakdown that the ultimate aim of these places is to understand gravity and if one of these places ever finds a graviton it will be headline news. DESY also, of course, has a ‘Linear Accelerator’ which is a device for the acceleration of subatomic particles at velocities close to the speed of light. One of the many things you can find in one of these accelerators is a ‘Z-Boson’. A Z-Boson is one of the fundamental forces of nature, the "weak force", is the one responsible for some forms of nuclear radiation. (For example, it is due the weak force that uranium is radioactive.) There must be gauge bosons which explain any fundamental force: in the case of the weak force, there are three, two "W bosons" and one "Z boson". So I guess one of the reasons Donald picked it is because it’s the most obvious/stronger of the two boson types. How thoughtful of him to make it so simple for us! One of the aspects of the Z-Boson is that it makes the otherwise unobservable neutrino visible when it interacts or moves, seemingly of its own accord. It is the presence of a neutrino that scientists believe is causing this reaction in the Z-Boson. It was thought in the '20s that when neutrons decay, the only remnants were a proton and an electron. However, experiments indicated that there also had to be a charge-less and nearly mass-less particle produced as well in order to ensure that there was no energy or momentum loss. This particle was called the "neutrino" (Italian for "little neutral one"). Subsequent experiments have indicated that there are three different types, the "electron neutrino", the "muon neutrino" and the "tau neutrino". Paul assures me that Myon is spelt wrong on the album titles and it should read muon. I found a reference to a muon in relation the Z-Boson in that the Z-Boson itself is produced by the quark-antiquark annihilation and decay of an electron positron pair of opposite charged muons. This is fairly confusing I know but if you read it back it does make readable sense. Surprisingly the Z-Boson or just the Boson appears to be the key to this album as it turns out that the two bosons yet to be discovered are the Higgs boson and the Graviton. So what is a graviton, well, current theories of physics say that all of the fundamental forces we see in nature can be explained by assuming that they are caused by emission and absorption of special particles called "gauge bosons". The graviton is the gauge boson that is exchanged whenever two masses interact via gravity. But look and this is all you really need to know about the Graviton. The main purpose of particle accelerators, like the one at DESY, is to find a graviton and if and when they do it will be one big step closer to a universal theory of gravity which in turn leads us to the possibility of the theory of everything, the holy grail of this field. When collusions occur in particle accelerators at close to the speed of light and if gravitons are being produced it is theorised that they may be existing in another dimension. Which is of interest to us in our study. I could give you loads of future references that these terms touch on in upcoming albums but I’ll take it record by record. Incidentally his next album, 'Biometry' by Der Zyklus, doesn't even touch on this subject. I will give you a past reference I believe I missed from Dexciya’s Grava 4 though. That albums vexing unlisted track called ‘Gravity Waves’ might be a reference to a graviton or more specifically the cohesive state of many gravitons together, manifested as a gravitational wave. Which is a fluctuation in the curvature of spacetime which propagates as a wave, travelling outward from a moving object or system of objects. Examples of systems which emit gravitational waves are binary star systems, where the two stars in the binary are a ‘White Dwarf’ (track title on Shifted Phases), a neutron star or in a black hole. I’ll get to this key black hole business presently. I wonder if there could theoretically be a dimensional aspect to these gravity waves as well? I’m sure I’ve said it before but you can take DRL as a work in progress, possibly to be completed by others unknown but I feel that at least the ground work is done. You will be finding new meanings in this stuff forever and that is why their music will stand the test of time, if not musically, then certainly conceptually. There is a quote which seems appropriate to this from Heinrich Mann when he wrote of Neitzsche, "One cannot be considered present merely because one's works are still read and historically assimilated. The number of a man's adherents and imitators proves nothing for his work or its fruitfulness. What is the test? The work of a man who has passed on grows and changes; he is still finishing it from beyond. It has long since moved from the point where we once found it...". Moving onto that other theorised but yet to be discovered Boson, the Higgs Boson. In order to be complete and satisfying, physics must have an explanation as to why particles have the masses that we measure. The leading candidate for this explanation involves particles called "Higgs bosons", and the manner in which these particles interact with others and generate their masses is called the "Higgs mechanism". This machine, also known as the Brout-Englert-Higgs mechanism, Higgs-Kibble mechanism or Anderson-Higgs mechanism, was originally proposed in 1964. Peter Higgs is the UK physicist who first proposed this idea. The Higgs mechanism itself is a form of superconductivity in a vacuum. It considers all of space filled with a relativistically invariant quantum fluid called the Higgs field, whose motion prevents certain forces from propagating over long distances. Part of the Higgs field mixes with the force-carrying gauge field to produce massive gauge bosons, while the rest of the Higgs field describes a new particle, called the Higgs Boson. The Higgs mechanism is the only way an elementary vector particle, like the W or the Z can have a mass. Although the evidence for the Higgs boson is overwhelming, accelerators have yet to produce one. So it is not clear if the Higgs is an elementary or a composite particle. Mind you, that hasn’t stopped Hollywood making one work. Check out the Stephen Soderbergh’s version of Andrei Tarkovsky’s Solaris. That brings us to ‘Niobium-Resonator’. Well, a resonator is a device for storing electromagnetic radiation, and niobium is a rare metal commonly used in building such devices. Resonator are vital component parts of the photoinjectors. As far as particle physicists are concerned, it might as well be gold. I found some statistics on how important this substance is for the future International Linear Collider (ILC). It will use over 500 tons of pure niobium to build 20,000 superconducting radio-frequency (rf) cavities, devices that accelerate electrons and their antimatter twins, positrons, along microwaves to near-light speeds. That means metal-refining factories would have to work at full capacity for three to four years solely to create highly-refined niobium for the ILC. Currently at three hundred dollars a pound, the niobium alone would cost the ILC upwards of three hundred million dollars. It will collide electrons with positrons. It will be between 30 km and 40 km long, more than 10 times as long as the 50 GeV Stanford Linear Accelerator, the longest existing linear particle accelerator in the world. .The country in which this monster will be located hasn’t yet been decided, it will probably be in operation by 2010 where ever it is, I wonder if Gerald Donald might do an album all about it someday? This brings me to the question, why DESY, why not CERN as he would a few years later with the next Dopplereffekt album, Calabi Yau Spaces. Maybe it’s not so much about DESY, although you could say it’s all about it, maybe it’s just a particle physics thing and the images just came from DESY this time, it could just as easily have been CERN, they do almost the same things there after all. But I am personally inclined to go with DESY this time. The picture of Gerald Donald and To Nhan Le Thi looks like their standing at the famous TESLA linear collider which was from late 2001 and early 2002 doing some of its most breakthrough work. Gerald Donald is certainly up to date with this stuff and maybe he felt that at this time DESY were the world leaders and he wanted to do a tribute or whatever to them. For example in September 2001, an international team of scientists succeeded in obtaining the maximum light amplification for ultraviolet radiation from the free-electron laser at the TESLA Test Facility. 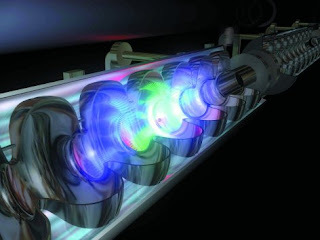 The electron laser reaches a light amplification of 10 million. This corresponds to the theoretically expected peak performance for such a device and presents a new world record. Then in March 2002, for the first time an accelerating field of 35 megavolts per meter (MV/m) is reached in a superconducting nine-cell TESLA cavity. It might not seen that interesting to the layman but it’s important stuff if your into it. CERN would make it’s own breakthroughs, not that it hadn’t already but this is down to the subjective mind of Gerald Donald and what he thinks is significant or just what had come to his attention at this time. In fact the Large Hadronic Collider (LHC), which is to be the world's highest energy particle accelerator, is currently being constructed at the CERN laboratory in Geneva, Switzerland and this baby might even be able to make black holes, small ones and if it doesn't they at least hope to finally locate the illustrious Higgs Boson and graviton with it. Donald is definitely concerning himself with the frontiers of particle physics and this is where I believe his present mind is never far from. If you understand this you can understand him. He doesn’t seem to take a position on the rights and wrongs of this research as he did when looking at NTT DoCoMo on the debut Arpanet album and I think that he is here going back to his original Dopplereffekt stance of accepting the good and the bad aspects of new technology, science etc. Which was, in a nutshell, the double standards of former Nazi rocket scientists bringing us to the moon. Particle physics isn’t all good either, far from it, nuclear bombs and power stations, radioactive waste, maybe even a future global catastrophe awaits us in one of these accelerators, who knows, where is it really bring us? That might be a question we should be asking ourselves. Whether Donald decides to tackles these questions himself or not will be interesting to see. Right now however on this album, he does appear to be making more of a pro-statement but he might be trying to catch us out, previously on the surface he also appeared to be taking a pro-Nazi stance but on closer inspection it wasn’t quite as straight forward as that. The Black Hole has since this album become a big theme for Gerald Donald, from the cover of the Arpanet ‘Inertial Frame’ album, it’s a light cone aka a black hole, to the Zwischenwelt track ‘Black Hole’ to name just two examples or I’ll be here forever. He had of course shown an interest in infinity before and black-holes themselves were mentioned on the Der Zkylus II 12”, one of the questions, which are all certainly from the mind of Gerald Donald, posed on the Abstract Thought album is also about a black-hole. But here on the back of this album is a computer generated model of the top cone of just such a phenomenon. I think this is one of the things which he is now choosing to explore more thoroughly than before, what it is, what would happen if you went into one, what possibilities might it lead to, those type of questions, are some of his major concerns from this point on. What this fascination with black holes might be telling us metaphorically is another thing. Does Gerald Donald see us as being stuck in a black hole, asleep, not fully conscious of what lies just outside, another reality. Donald may be yearning for something deeper, some break-through in our knowledge of atoms, of what us and the universe are made of, which will answer everything and may give us once and for all a meaning to life. Now, I don't know about this either but you have to wonder where this research into particle physics is leading for the consciousness of Man? T he question, "Who will benefit and who will suffer? ", from the just previous to this Arpanet album comes to mind. Donald said when speaking of his interests in the constant advancements in mobile technology, "Evolution is their most interesting feature." I think in this way he is equally interested in what our progress and interest in particle physics and quantum mechanics says about where we are as a species than what it actually finds out about our universe. Essentially, I think in evolutionary terms he is trying to awaken a sense of awe in us. This same sense of awe which he so obviously feels about particle physics. The human psyche can be broken into two main drives, pleasure/love, which is outward and expansive, evolutionary and anxiety/fear which is inward and non-adaptive, de-evolutionary. Depending on the person then this type of awe could go either way, the pleasure of discovery or the fear of the unknown. Donald of course would want us to use it to our advantage, we just need first to get over our fear, stop ‘Running From Love’ (track from The Other People Place album), 'Don't be Afraid of Evolution' etc and then we can continue to evolve. As an artist he has certainly found a fertile ground to spark off idea's, imagery and concepts. The liner notes are pretty scant but an email address is given to get in touch with Donald via dataphysix at scientist.com. This was also the case for the Arpanet album which was just previous to this. So as I stated then he has decided to continue to make himself contactable by fans or for more professional reasons like remixes, bookings etc. Two websites for DESY are also listed. 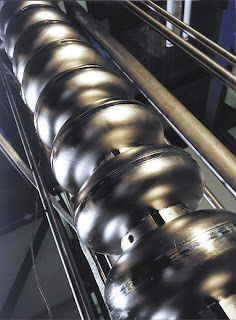 The images are credited as Images: Photoinjektor des Deutschen Elektronen Synchrotrons Desy Zeuthen. Which makes me think that the photo’s are mocked up as surely a photographer would have to be credited. Mind you, they do look genuine, I would love to know if they were granted access. Again, it this vein it would be interesting to know if NTT DoCoMo were made aware of the previous Arpanet album. No artwork credits are given. I have written elsewhere how you can break James Stinson/Drexciya into an inner personal evolution on both the early material compiled for The Quest and of course the Storm Series and that Gerald Donald’s projects can be seen as more of an impersonal, observation of evolution, concerning itself with the journey into the heart of matter, time and space, in both directions, micro (atomic level) and macro (outer space), but of course the more you go into those two extremes the more they seem the same. Although Drexciya did move into this terrain on the final Storm, Shifted Phases and their first and critical post storm album 'Grava 4. Which makes me think they were both on the same wavelength by the end, or more probably, on multiple levels of understanding at the same time. There are traces of this interest in physics dotted throughout the Drexciyan catalogue as well but it is not the driving force, more evidence of their thinking on multiple levels. I would like to think that with Donald’s move into the realm of ESP and the more esoteric avenues of Black Replica and Zwischenwelt, he is taking a step into an area that starts to possibly make a certain amount of sense at the frontiers of micro and macro knowledge. But it is a tentative step to date in some ways as he is doing it through collaboration and leaving it largely in cyber space. There’s a sort of admission on his part in this that he knows it is only a detour from his main concept, for now? But this approach might yet yield results for him, the most famous of these more head-scratching experiments, known as the double slit experiment, was done way back in 1801 by Thomas Young when he was sending photons of light through two slits and at first got a pattern of interference on a photographic plate where the light fell, but when reduced to one photon at a time it did not arrive. The question being then, how could it interfere with itself, how did it 'know' that the other slit was open and where has it disappeared to anyway? Into another dimension with the graviton? As if you now close the other slit the photon finally arrives but close it again and it disappears, this change is almost instantaneous and in space-time it actually has to be happening faster than light for it to happen because it is affecting light. What is going on? There are other experiments too where the observer affects the outcome of the experiment. Does the particle/universe know it’s being watched? Other titles on forthcoming releases will be 'EPR Effect' and 'Twin Paradox' and if you look into what they refer to then it looks more likely that the nature of these types of experiments are on Gerald Donald's mind. What things like this soon lead you to is, as I said, the possibility of there being ‘extra-dimensions’ (a phrase projected when Dopplereffekt played live last in 2007), black-holes, worm-holes and extra sensory perception to name but a few. But that all comes later, right now on this album he is still searching for a rational explanation, not that quantum mechanics is always rational! This almost 7000 word article, by far my longest, is testament to the old adage that the less information you have the more you have to use your imagination. Which I’m sure Donald understands very well. In this case my over zealous research and speculation has no doubt blurred the meaning of the album for you. But basically if you remember nothing else you can break it down thus. Musically it gets progressively more accessible and is the first of his albums to fully synergise subject and music; the theme is high energy physics, in particular the on-going search for the elusive graviton. There now, I should have done that in the first place! There is a feeling that Donald picked up the pace after this album, I don't think he was ever particularly slow but from now up to 2007 he would release an album each year which is good going by anyone’s standards. My next port of call when considering Donald again will be the debut Der Zyklus album 'Biometry' which turns out to be another side step conceptually which should serve as a warning (to me) not to think you ever have Gerald Donald totally figured out.